The feeling to which I refer is probably familiar to readers around the world. You know the one - you're in the bookstore, all of your favorite authors are between installments, and then you choose something based on the back cover (paperback) or inside flap (hardcover). Who knows if this will be worth your time or end up in your next garage sale? I am grateful for the day I discovered Jim Butcher and "The Dresden Files," because that is a well-written, enjoyable series in its own right. However, having been a sword-and-sorcery connoisseur for much of my life, I may be even more pleased with the Codex Alera. Mr. Butcher has created a world and society that are different enough to capture interest (the furies are an inventive twist on "magic") but familiar enough so that you don't spend all of your time trying to puzzle out different languages and unpronounceable names. I'll make this short, if you like epic fantasy this series is for you !! Civil war is far from unknown in the post-Roman magical land of Alera, but with an aging First Lord and no heir in the picture, the high nobles are even more restive than usual. Even more unusual, though would be an alliance with the Varg. These non-human aliens have engaged in low-level warfare with the Alerans for centuries. When fhe First Lord tricks the High Lord of Kalare into launching his attack prematurely, Kalare's combination of hostages and an alliance with the Varg, threatens just might destroy the empire. Still incapable of magic, Tavi has been sent to a new legion for training. But when Varg ritualists call down magics to destroy the legion's entire officer corps, Tavi must find a way to stem an invasion beyond anything Alera has known--with only the inexperienced troops on hand. 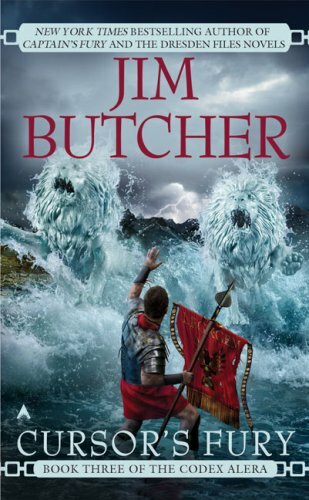 Author Jim Butcher continues his CODEX ALERA with a compelling story that follows two major plot lines. In one, Tavi continues to grow, learning to lead men, develop strategies, and develop an understanding of the powerful nobles who threaten the empire's stability, of Alera's enemies, and of the ordinary legionaires who form the basis of the empire's power. In the second, Tavi's "aunt" Amara, united with Lady Aquitaine only through their shared need to prevent Kalare from gaining the First Lordship, attempts to rescue Kalare's hostages--doing so would allow the First Lord to free up additional legions to confront Kalare, but Kalare guards these hostages with some of his most deadly troops. Although Butcher is best known for his excellent DRESDEN FILES series, the CODEX ALERA series is a wonderful extension of his talent, with an intriguing alternate world diverging from our own when ancient Romans learned to control and personify the elements of air/earth/fire/water into elemental furies. Tavi, with his unique lack of any magical ability, makes a sympathetic character--as he grows to the point where he might make a claim to be First Lord himself. While I was a fan of Butcher's Dresden books, I wasn't sure about starting his fantasy series. I wasn't sure how well he would make the switch, and I was worried that we might end up with a recycled version of Harry in a more fantasy-type setting. All my misgivings were false. Jim Butcher is rapidly growing into one of the best writers I've encountered. He's currently maintaining two active series that are different in pretty much every way. One is first person, the other is third. One if contemporary urban fantasy, the other is high fantasy. One focuses entirely on one central character, the other follows around several characters all engaged in different activities in different locations. And, most amazing of all, he does both very well. In his Alera books, Butcher switches the perspective around to keep you up to date with what several different characters, or groups of characters, are busy with. And, he weaves this together to tell a central story about what's going on. He shows how these seperate activities in different sections of the empire effect everyone. This series, and especially this book, is filled with excitement, intrigue, and plot twists. Many things come as a surprise, and even those that don't are told in such a way that it is still exciting when they happen. Tavi, one of the hero's of the series, has pogressed from a simple farm boy to an agent of the emperor, and now into the commander of one of the empire's legions. He must defend a vital passage leading into the heart of the empire. While this is going on, a foreign invasion by a hostile race is landing near his position. And, that's occuring as one of the high nobles betrays the crown and makes a bid for power. While Tavi must work to keep his legion together, others are on a mission to rescue hostages from a dangerous rebel. That mission includes not only loyal subjects, but others believed to be conspiring against the emperor themselves. After what I thought was a lackluster second volume in Jim Butcher's Codex Alera series, Cursor's Fury was a fun and exciting read that kept me on the edge of my seat. Cursor's Fury is broken in to three major story lines: Tavi and his battles with the invading Canim, Isana and her fight to save Fade while Lord Kalare foments a civil war, and Amara as she, Bernard, and Lady Acquitane travel to Kalare to free hostages. The final story is probably the weakest and less exciting of three. In fact, Butcher pushes it into the background for most of the novel. Rightly so, the majority of the novel focuses on Tavi and his battles with the invading Canim. Butcher is at his finest when he's writing battle scenes. He's obviously done his homework on battle tactics, Roman tactics in general, because he writes them so well you feel like you're right there with the characters. I don't normally get that excited about battle scenes, but Butcher makes them very accessible to the reader. It's also during these scene that we witness the growth of Tavi into a strong military leader who earns the respect of his men. The best part of these novels so far has been the growth of Tavi from the bumbling character we met in Furies of Calderon to the strong leader that emerged in Cursor's Fury. Isana is also a character that continues to grow and change. I won't reveal any spoilers (even though by now ever reader surely knows the big reveal even though we've suspected it pretty much from the beginning). While a lot happens with Amara, I found her whole story rather forgettable, but important things do happen that could have repercussions in later novels. Jim Butcher has demonstrated himself to be a consistently surprising author. The Codex Alera novels have been outstanding. Though I have long been a fan of the Dresden series, it was with a certain degree of trepidation that I stepped foot into Alera. Three novels later, I am more than enthralled. While there is no shortage of the extensive battle scenes that have come to characterize the Codex Alera, they are far from gratuitous, and serve to further the plot quite nicely. I find my self reading chapters and chapters past my pre-determined stopping points, and look forward to being able to come home and pick up the book again. After getting about halfway through the second novel, I went and bought the entirety of the series so I wouldn't have to be interrupted with pesky trips to the bookstore. Magic takes a decided step away from center-stage in this 3rd entry in the Codex Alera series as the focus is on Tavi assuming the role of a legionairre. The action, strategy, and interactions between characters are very strong in this book. Even better, past history is finally addressed, and the truth of Tavi's origin and lack of furies is revealed. Went from Dresden to Codex and love them both. I've read the negative reviews here on Amazon for this book and I have to disagree. The one person who wrote a review and gave it two stars sounds as though he is much more well read than I, so I'll give it to him. He sounds like a very dedicated and educated sci-fi reader and I would imagine him to be very particular, somewhat like a sommelier is with wine. When it comes to wine, I know what I like and I know what I don't. That's about as much as I can tell you outside of the basics. The same can be said about my reading. Don't get me wrong, I've read and enjoy the classics, but they are just not as much fun for me as other things. I very much enjoy Jim Butcher as an author. I was put on to his Dresden series by a friend and ate them up. All of them. Can't wait for the next one. Then he also put me onto the Codex Alera series. LOVE them, too. Read the first three in about as many days and actually ponied up the dough for 2 day shipping from Amazon for the 4th, Captain's Fury. I'm a huge, huge fan of George R.R. Martin's series, A Song of Ice and Fire. The Codex Alera is not as intricate or complex as Martin's series, but it doesn't make it any less enjoyable. I enjoy a series with a character that has something special about him/her that developes over the storyline. I enjoyed that with Orson Scott Card's Alvin Maker series, Neo in the Matrix, Gambit and Wolverine in X-Men, so on and so forth. I enjoy that with Tavi in the Codex Alera. I have hope that he eventually finds his Furies and becomes an absolute monster of a powerhouse with them and reading about his journey on how to use them. I find that I'm also hoping the same thing happens to Dresden. Overall: 4 stars -- good action, some character development, advancement of the plot and the introduction of another enemy race (aka be ready for book 4). I enjoyed the book quite a bit. It was a fairly quick read but it also was involving enough that I did not want to put it down. I am curious to see how much Tavi becomes powered up in the next book. Characters: The story line has advanced 2 or so years. Tavi develops his own voice and a style; you might say he is comfortable in his own skin and starts taking responsibility for others not just himself. Amara and Bernard get a fair bit of development in the book. It makes you want to read more of their interactions. Gaius seems to have recorvered a fair amount which seems a bit odd given the prior book. You find out a fair bit more about Maximum and Isala. Action: The action sequences are consistent with the other books in the sequence. It does have some new tricks that the characters employ which is good to see development in tactics. The pacing is really quite good. Plot: The plot lines were mostly setup in the prior book, but executed fairly well in this plot. The Canim seem to have joined forces with Kaladarus (sp?) in trying to take over Alera. It should be obvious to anyone that the Canim are really working their own large scale game of Ludus (chess) here. There is an interesting twist on Fidelius which has some intriguing implications. Writing: It is very similiar in style and tone as Jim Butcher's other books. Nothing new here, nothing outstanding either. I stumbled on the Dresden series by luck and when I started reading the Codex Alera novels I couldn't wait for this one. I was not disappointed. I've been reading science fiction and fantasy all my life, like many of you. You know when you find a good writer. Jim Butcher is a rare talent, and seems to be getting better with each book he writes. He also seems to write new books fairly quickly, which is obviously important to us readers (How long has the Wheel of Time been turning?). Each book in the Codex Alera is superb, and Cursor's Fury is no exception. So what? Lots of writers do that. But how many series have you read where the author starts out great, then after a couple of books the story starts wandering across an overly descriptive landscape with characters that do nothing but talk? For example, I loved the first books from Jordan, Eddings, and Goodkind. Well, enough of that. Jim Buther creates great characters on both sides - not just the good guys. Every plot line he opens he brings to a logical conclusion. Yes, the major story ends with a teaser, but we want that. You can actually finish the book satisfied, but still wanting more. If you've read Modesitt, you'll understand what I mean, although Modesitt's books are a little more standalone. Tavi is all grown up! This is some of the best fantasy I've read in a LONG time. It isn't often that you get Tri-fecta- Great story, great characters, and great writing. Cursor's Fury (2006) is the third fantasy novel in the Codex Alera series, following Academ's Fury. In the previous volume, Doroga and his horde destroyed one vord nest at great cost. Then Doroga and Walker assisted Bernard, Amara and the Calderon garrison attack another vord nest in the valley. A third vord queen had started a nest in the Deeps under Alera Imperia. Then she led the Taken Canim and her spiders in an attack on the First Lord in his meditation chamber far underground. Tavi learned of the attack and warned the Royal Guards barely in time. All the attackers except the queen were killed, but she escaped and couldn't be found anywhere within the capital. The Canim Ambassador was imprisoned despite his innocence. In this novel, two years have passed and Ambassador Varg is still locked up in the Grey Tower. Tavi often visits the Ambassador and plays ludus with him. Since Varg has been playing the game for six hundred years, Tavi doesn't win any games, but the ambassador is impressed by his progress. Gaius Sextus -- the First Lord -- decides to incite High Lord Kalare into starting the civil war prematurely. He has Tavi ask Gaele to deliver some letters, including one to High Lord Aquitaine stating that he will be declared as the First Lord's heir. Since Gaele is really Rook, the message will surely reach High Lord Kalare quickly. Tavi rushes off to pack, for he is being sent to the ruins of Appia to study with Maestro Magnus. The Maestro needs a research assistant and Gaius needs a spy in the south. Unfortunately, Tavi will be going alone to Appia, since the First Lord won't let Fade or Kitai go with him. Magnus is a reconstructionist. Since the legends tell of mechanical means of throwing stones, he tries to build a trebucket. The models break every time, but the fifth attempt is successful. Magnus yells and dances with glee and Tavi lets out an excited laugh. Then the same stone comes back toward them and smashes the device. The stone had nearly knocked off the head of Antillar Maximus, so he had thrown it back. Tavi yells when Max comes in sight at full charge and the other cursor recognizes him. Still, Max is astounded at the power of the trebucket. Max has come to give Tavi new orders. He will be joining the First Aleran Legion as the third subtribune to the Tribune Logistica. This legion is the first one with volunteers from every city. Max is going along as a centurion to teach Tavi the ways and skills of the legions. Magnus is also going as senior valet for much the same reason. In this story, Rook takes a Kaleran air coach back home to deliver her information. The most significant is the letter to Lord Aquitaine. As Gaius guessed, Lord Kalare quickly starts mustering his troops for the war. Lord Kalare lets Rook visit her daughter Masha for a short while after the information is delivered. Masha wants to know when they can move to the country so she can have a pony. Then Masha wants her to stay even longer, but Lord Kalare has other tasks for Rook. Ehren is working to untangle the books of Master Ullus -- a fence at Westmission in the Sunset Islands -- and gathering information for the First Lord. One day, Captain Demos drops by to sell some goods that he doesn't yet have, but he does have a detailed list of the items. While he is dressed like pirate, Ehren assumes he is a cutter from his roving eyes and graceful movements. Ehren reckons that Demos is headed west to the Canim. When Demos comes back to Westmission, the Canim ships are close behind. Ehren bargains for a ride to the mainland. He has to tell someone that the Canim are invading. This tale leaves the First Lord with two problems (not counting Lord Aquitaine's future ambitions). The first is the revolt by Lord Kalare. The second is the Canim invasion. Of course, Gaius doesn't know about the invasion quite yet, since messages from the First Aleran are still in transit. Tavi is up to his ears in problems. At least he has friends with him, including Kitai. He is learning much about being a legion commander. Knowledge of the truth about Tavi's parents is spreading. So far, only his friends know, but they are not telling him for various reasons. Even the First Lords knows, but keeps it quiet to protect him. Enjoy! Highly recommended for Butcher fans and for anyone else who enjoys tales of sword and lance, exotic magic and passionate romance. Many other reviewers have gone into the plot details of this novel, so I'll skip that and go immediately to the part where I rave about the series. When I discovered the Dresden Files I devoured the paperbacks my son-in-law loaned to me and then ordered the entire series to date in hardcover. Butcher is one of those authors that hits the ground running with the first book, gains speed until he achieves lift-off, and then cruises at 30,000 feet. Both the Dresden Files and the Codex Alera series begin well and just get better. I have read all of Jim Butcher's books - both the Dresden series and the prior books of Codex Alera that lead to this one, but Cursor's Fury is without doubt his best work so far, and moreover it definitely deserves one of the top spots as the most thrilling fantasy story ever written. Cursor's Fury is mainly the story of Tavi's first real assignment as an Cursor in the First Lords service - nothwithstanding all the scrapes he got into before. He is a spy who must play the role of a sub-logistics officer in the newly formed, kid-green Aleran legion. This is a legion that is formed from volunteers and cast-offs from every Aleran city and hence is a legion loyal to no lord, trusted by no one and rife with spies for every lord and faction. At this time, the High Lord Kalare makes his move to topple the First Lord. The First Lord Gaius finds to his dismay that Kalare has trained and formed more than the 3 legion limit available to a high lord and captured hostages that deprive Gaius the support of the high lords friendly to him. Not only that, Kalare has taken the help of Canim sorcery to affect the weather preventing the quick transport of troops by the Knights of Air. Gaius directs Amara to free the hostages - and this rescue with the help strangely offered by Lady Aquitaine, forms one thread of the story. After civil war erupts, the disparate Aleran legion is sent to the farthest corner of Alera to keep it from interfering in any matters. The legion is expected to relax and do nothing. Tavi's transformation here - from an undercover Cursor to a veteran legion Captain is spectacular. He uses every ounce of his strength and courage, every trick he can conjure, and every part of his unique insight into Canim culture to counter the Canim attacks and earns his place as commanding officer in the eyes of his troops. The Canim battles are especially vivid and the final battle on the bridge is something that lives on in your imagination long after you have finished reading the book. The Canim battles sequence with Amara's resue and the story climaxes into a very satisfying ending, with some enjoyable secrets revealed at the very end that sets up the stage for the coming sequels. Tavi is now a fully fledged cursor and Gaius sends him to a newly formed legion under cover. However, as a few other characters point out, Tavi has a gift for attracting trouble and this assignment proves that gift true. This series seems to be getting better with each book. Tavi is still a likeable main character who you cheer on - though you can't say the same of some of the other people in the book. This installment in the series also starts to provide some concrete answers to the mysteries in Tavi's background which is very welcome development - and I have to say the end of this book is very encouraging for the next volume in this series. I'm very much looking forward to the next book of the Codex Alera and am glad I have stuck with it so far. This is a wonderful series that I highly recommend. If you like Sci Fi/Fantasy books this series is def. for you! When I read the first book I was hesitant in the beginning but by the time I got to the middle of the book I was hooked. Since reading the first book I have purchased all the rest in hardcover as soon as they are released. I can't wait for the next installment! This series will surely please you it gets better with each book Jim Butcher is a wonderful writer with a vivid imagination! Jim Butcher has certainly come a long way from his earlier novels (which were a lot of fun also) and has created an exciting and involved fantasy world for many readers. Watching the development of his main character Tavi is certainly enjoyable and suspenseful and as usual his action and battle scenes are well painted and the highlight of his books in general. There is, however, little sense of good vs evil, right vs wrong, moral dilemna...the book is still exciting at times but lacking in depth and not as humorous as his prior work. Cursor's Fury continues the three separate story lines of this enjoyable epic fantasy. The main story line is the coming of age of Tavi, no longer a boy but a young man. Unable to wield the magic furies that he should be able to command, he settles for being resourceful and courageous. This installment sends him on what should be a safe mission to a legion composed mostly of trainee soldiers. By a twist of fate, this legion is the only one in position to oppose a foreign invasion of monstrous creatures and Tavi finds himself commanding the legion when the senior officers are killed by a magical strike. This is a great story! Five stars, no question! A secondary story concerns Amara, an agent of the Crown who is now the wife of Tavi's uncle Bernard. While I like these characters, I'm starting to find their story a bit repetitive: desperate battles, flying chases, hair-raising rescues. But it's good action and good fun, easily four stars. So good I decided to reread the first books. I was worried about what would happen to the characters I liked so much from the first and second books, would there be a messy ending for Tavi's relationship with Kitai? What about Amara, Isana and Bernard? Well, I was not disappointed, this book was even better than the last book. The realistic feel of a roman legion, the terror of the Canim invasion, new revelations about Gaius, Tavi, Fade and Isana, well, it had everything I never knew I wanted. I can slap down two to three books a week and it wouldn't be unheard of for me to finish a book the size of Cursor's Fury in two nights. As a matter of fact, that is about how long I finished the first two in this series. Yet, it took me three weeks to complete this book. I would pick it up, become discouraged or distracted, put it down, finish another book, then pick this one up again to continue the cycle. It wasn't that Butcher didn't create a great book and continuation of the Cursor series, it was just too much war for me.